Everything seemed over after 51 minutes at which moment Roma lead by 0-3 after goals of Mexes, Burdisso and Totti. Only 1 minute later Palacio scored 1-3 and a little hope returned in the hearts of the Rossoblu. Because of injuries Mr. Ballardini had to substitute Milanetto and Rossi by Veloso and Paloschi, who immediately scored 2-3 in the 68th minute. Only 6 minutes later it was again Rodrigo Palacio who scored: 3-3. In the last 15 minutes the incredible dream came true: also Paloschi scored his second goal and brought the result of 4-3 on the scorebord. Tonight Genoa did win the first derby of this season by 0-1. After Palacio and Rossi hit the crossbar in the first half it was Rafinha with a fantastic shot of 25 meters in the 54th minute who decided the derby: 0-1. A honest victory of the team who was without any doubt the best team in the field. This goal of Rafinha reminds us all at the famous Branco-goal in the past, both players are Brasilian. Bari-Genoa 0-0; Wednesday 18.30 derby !! Another goalless draw of Genoa and just as against Chievo the feeling is that we lost 2 points and not that we can be happy with the draw. Already in the 9th minute Palacio hit the post after a good combination with Kucka. If this would be a goal, the match surely would be completely different. The positive thing about this match is once again our defense, which is very good if Dainelli is in the field. Also Eduardo is much more comfortabel in the goal if “the wall of Florence” is in front of him. 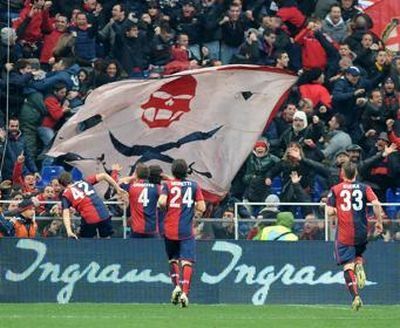 Wednesday Genoa plays at 18.30 hours the away-derby that was posponed just before Christmas. Mr. Ballardini and his staff have a completely healthy selection except the long-time injured Boselli and Destro. A good match of Genoa that ended in a 1-1 draw with goals of Pato and Floro Flores in the first half. With Dainelli, Rossi and Milanetto back in the team Genoa played probably the best match so far this season. After an amazing assist of Ibrahimovic it was Pato who scored the opening-goal. Just before halftime Mark van Bommel helped Genoa to block the ball of Konko towards Floro Flores who beat goalkeeper Abbiati easily: 1-1. In the 2nd half both teams got some chances but after all a draw was the most right result. Again Genoa lost in Florence by 1-0. Like almost every year we deserved a draw in a horrible match in which none of the teams earned 3 points. This year it was an error of Eduardo (his fourth after the matches against Inter, Juventus and Udinese) who gave Santana the chance to score the only goal. The only big chance of Genoa was missed by Criscito, while Floro Flores, Palacio and Paloschi had difficult opportunities. Now Genoa is 13th in the standings and Sunday we play at home against nr. 1: A.C. Milan.